In this Oct. 8, 2018, file photo, mourners and police officers from around the country attend a memorial service before the funeral for fallen Florence police officer Sgt. Terrence Carraway at the Florence Center in Florence, S.C. Sgt. Carraway was killed in the line of duty Wednesday, Oct. 3, 2018. More police officers have died in the line of duty this year than in 2017. That's according to data compiled by the National Law Enforcement Officers Memorial Fund. The organization said in a report Thursday that 144 federal, state and local officers have died so far in 2018. That's up from the 129 who died last year. More police officers have died in the line of duty this year in the United States than in 2017, according to data released Thursday. The most common cause of death was gunfire, and vehicular accidents claimed nearly as many officers' lives. The National Law Enforcement Officers Memorial Fund said in a report that 144 federal, state and local officers have died so far in 2018. That figure represents roughly a 12 percent increase from the 129 who died in 2017. The majority of the officers who died were either shot -- 52 this year, up from 46 in 2017 — or fatally injured in car or motorcycle crashes, which accounted for 50 deaths. Other fatalities involved heart attacks, strokes, drownings and cancer and other illnesses among those who responded to the 9/11 World Trade Center attack. Of the officers who were shot, eight were killed during investigative activity and six were killed while responding to calls of a domestic or public disturbance, according to the report. Two were fatally shot while serving warrants, two died while handling or transporting prisoners and two others were inadvertently shot by other officers. Craig Floyd, the fund's chief executive officer, called the increase in deaths disappointing after a decline in 2017. "Sadly this reminds us that public safety is a dangerous job and can come at a very steep price," Floyd said in a statement accompanying the report. 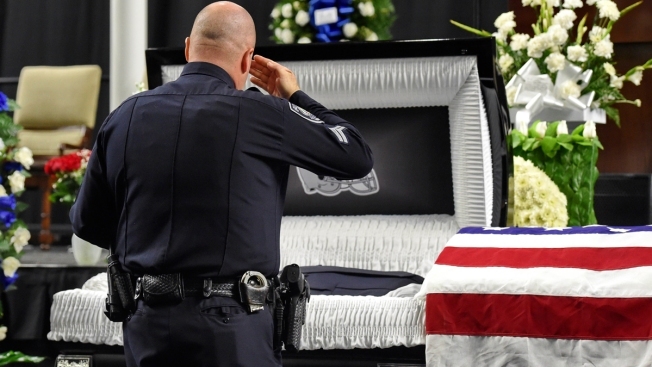 "We must never take the service and sacrifice of law enforcement officers for granted, and we must remember the families of the fallen who are left behind." Of the officers who died in traffic-related incidents, 32 were killed in crashes involving another vehicle and 14 were struck while outside their vehicle. An additional four were killed in motorcycle crashes. The officers who died in 2018 include a sheriff's deputy in Sacramento County, California, killed in a shootout at an auto parts store; a Greensboro, North Carolina, police officer killed in a car crash while responding to a call for a robbery; and a Greene County, Missouri, sheriff's deputy who drowned when his car was swept away by rising water. The states that experienced the highest number of officer fatalities were Texas, California, Florida and New York, with 11 fatalities each.